How To Manage Your Plumbing System Like A Pro! Occasional plumbing problems are part of owning and using a plumbing system. From time to time, home and business owners may have to call an Ocala plumbing company to address a leaking faucet or a clogged toilet. The frequency of these plumbing issues and the occurrence of more severe plumbing issues — including corroded pipes, clogged drains, and water leaks — are typically determined by the amount of preventative care and professional plumbing maintenance performed throughout the lifespan of the plumbing system. Don’t wait until it’s too late to address the needs of your plumbing system. Maintain the integrity of your plumbing system to avoid expensive and inconvenient plumbing disasters with the following preventative plumbing tips from the plumbing repair experts with Sunshine Plumbing and Gas. Among the most common plumbing issues are improperly functioning toilets due to clogged pipes. The most effective method of preventing problems with the commode is to avoid flushing any type of debris. Feminine hygiene products, disposable baby wipes or makeup-remover wipes, paper towels, and ear swabs are among the long list of unflushables that, when flushed, accumulate to form large, stubborn clogs in pipes. Even household products that claim to be safe for pipes and plumbing, such as flushable cat litter, can damage your system and render the pipes obsolete. As a rule of thumb, flush only natural waste and toilet paper and throw the rest into the trash bin. Call us for more expert plumbing tips to keep your toilet drain clog-free. We will perform a comprehensive plumbing inspection to ensure your pipes are in optimal condition. The age of your pipes matters for the overall quality of your plumbing system. Unless your historic home or mid-century commercial structure has recently been repiped by a professional plumbing repair company, the pipes are likely old and brittle. Frustration with slow-draining sinks and bathtubs may tempt you to reach for an abrasive chemical pipe cleaner. But over time these chemicals cause extensive corrosion, resulting in piping leaks. This leaves home and business owners with the expense of having to repipe the entire property and the inconvenience of remediating any potential water damage from leaks. The next time you experience a stubborn drain clog, use a natural drain cleaner that utilizes gentle, but effective enzymes to eat away clogs. Passing on heavy-duty drain cleaner will prolong the lifespan of your pipes and further prevent issues. Cooking grease, frying oil, and other food-related substances with high fat contents do not belong in your kitchen drain. These fatty food products may leave the hot cooking pan in a liquid form, but these substances coagulate into a solid form after being poured down the drain. When poured down the kitchen drain, the liquid-to-solid grease hardens into a stubborn clog, resulting in the need for immediate plumbing services. Avoid hefty blockages to your kitchen drain and pipes by allowing hot grease and oil to cool. Once cooled, gather the solidified substance into biodegradable disposable containers and throw them into the trash. In addition to preventing pipe clogs, this method for disposing of fatty items will reduce the amount of clean up required with grease-filled cooking pots and oil-filled baking pans. 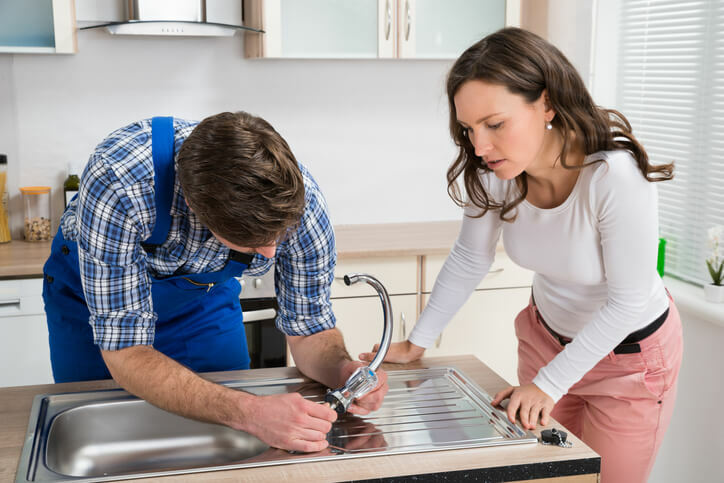 According to our master plumbers, the vast majority of leaks that occur within a plumbing system develop without clear signs, such as water visibly pooling around appliances. Leaks that are identified early on are significantly easier to repair than leaks that have developed and spread throughout the residence. To find out if there is a leak on your property, turn off all of the faucets, dishwashers, and any other appliances that use water throughout the structure. Once all appliances are shut off, inspect the water meter for movement. If the water meter continues motion, it’s likely that your plumbing has developed a leak. Another way to identify a potential leak is to inspect your monthly utility bill. If the water bill has increased, but your usage hasn’t changed, you may have a leak. If you suspect a leak, shut off the water and call our plumbing company right away to prevent the issue from becoming more severe. The most inopportune moment to search for your property’s main water shutoff valve is during a plumbing crisis, such as burst pipes and pipe leaks. Knowing the specific location of your main water valve and understanding how to properly turn the water on and off is essential. Knowing the valve site allows you to effectively remediate further damage during plumbing disasters and prevent emergencies during extended time away from the property. If you plan to leave your home or business for more than one to two weeks, turn off the main water valve prior to your departure. Thereafter, open any sink, bathtub or shower faucets to allow the remaining water to drain — this keeps pressure from building within water pipes. Our plumbers can help you identify the location of your water shutoff valve and teach you how to properly shut off and turn on the water to your property, giving you peace of mind while you’re away. Making smart decisions about your plumbing system can help you prevent the occurrence and reoccurrence of a number of plumbing mishaps. But the only way to ensure optimal function to your plumbing system is with a professional plumbing inspection from Sunshine Plumbing and Gas. Our professional plumbers will thoroughly inspect the pipes, mainline, and every additional component within the plumbing system to ensure each part of the system functions as intended. We recommend scheduling plumbing maintenance at least once each year to identify and repair any minor issues, preventing more severe problems from developing. Whatever your residential plumbing or commercial plumbing needs, we have you covered! Contact us today to schedule plumbing services in Ocala, FL.